Discharging over 3 million gallons of 135°F water each day, the mineralized hot springs at Thermopolis are the largest in the world, and form the main feature in the oldest state park in Wyoming, created 1897. 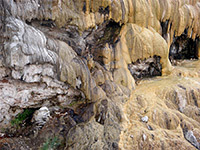 The springs have created a beautiful terrace of white, yellow and brown travertine, on the banks of the Big Horn River - very similar in appearance to the grander formations at Mammoth Hot Springs in north Yellowstone - and are accompanied by several other unusual geological features including sinkholes and sulfurous vents. Hot Springs State Park is a small preserve, occupying just one square mile, and besides the springs contains a section of grassy hills above the river, home to a herd of around 25 bison, which may be viewed close up via a short scenic drive. 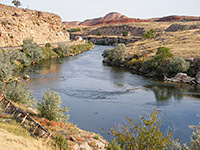 Despite these varied natural attractions, however, the whole park is urbanized and developed; all water from the springs is channeled and regulated, some directed to two bathing pools which provide the main attraction for most visitors, and are part of a varied assortment of buildings that also includes a wellness institution (Gottsche Rehabilitation Center), an assisted living house (Wyoming Pioneer Home), a cafe and two hotels. But the park is a pleasant location, free to enter, and the combination of the river, the terrace and the rolling reddish hills is quite photogenic. The state park is easy to find in Thermopolis, being just off the main road (US 20) on the north side of town, and well signposted. The place has a slightly confusing layout, with no entrance station and various intersecting paths and tracks, but the main road leads to the parking area next to the larger of the two bathing houses, which is operated by the state and so charges no entry fee. The other pool is a private operation and offers similar facilities, closer to the river. The main spring is located a short distance north, though it isn't much to look at, just an unremarkable shallow pool at the edge of a low hill, enclosed by railings and smelling slightly sulfurous; from here the water runs through several ponds and towards the river, where run-off from other smaller springs combines to form Rainbow Terrace, a smooth, patterned travertine formation extending for 1,000 feet. 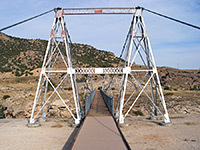 Paths circle the edges and a boardwalk crosses the center, allowing for close-up views, but the best perspective is from the far side of the river, which may be crossed on Swinging Bridge - a historic iron suspension bridge that does indeed wobble when in use. Just beyond the main terrace area, Black Sulphur Spring is a narrow pit with a floor of gently bubbling sulfurous mud, though the depth of the hole makes the spring difficult to view. Past here the road continues northwards past several sinkholes then loops over the grassy land to the east, occupied by the Hot Springs State Park bison herd. 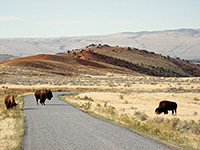 The animals wander freely across the prairie, often close to the road, and can be photographed quite easily. Also available in the state park are picnic areas, flower gardens, a fishing pier and two boat ramps, but no camping facilities. Best Western Plus The Plaza Hotel is by general agreement the top choice for hotels in Thermopolis, and it has a privileged location within Hot Springs State Park, just a few minutes walk from the world's largest hot springs and the beautiful Rainbow Terrace on the banks of the Big Horn River. The hotel occupies a historic brick building along Park Street, one block from US 20, and it contains 36 elegantly decorated rooms & suites, some with one or more of a microwave, refrigerator and log-burning fireplace. For relaxation, the Best Western has both an outdoor pool, and a hot tub spa filled by water piped from the springs. Continental breakfast is provided free of charge; for other meals there are several restaurants adjacent.